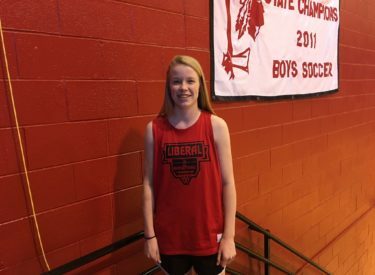 Liberal sophomore basketball player Whitney Hay is the Mead Lumber Athlete of the Week. Hay scored 16 points in Liberal 44-32 win at Dodge City on Friday night. She made three of five three pointers in the win. She is averaging seven points and three rebounds per game. She also plays volleyball and will run track. She and the #9 8-1 Lady Redskins play in the Salina Invitational Tournament Thursday at 3 against Buhler on 1270 and kscbnews.net. Hay’s interview will air during Thursday Sportsguys.